Holi is all about splashes of vibrance and joy disguised in colors. 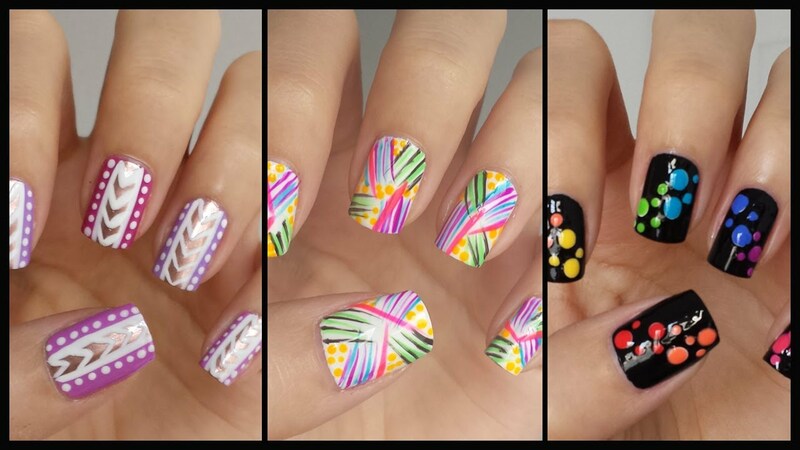 Pay an ode to the festival with these multi-colored Holi inspired nails. With designs and trends that change every season, newer tools and the explosion of creative ideas, nail art crosses new levels each season. Nail art is a fantastic way to express creativity when you play with a kaleidoscope of colors, patterns and forms that make your talons look stunning and make them conversation starters. To execute beautiful nail art, you don’t really need to always run to a professional manicurist or horde up on a plethora of equipments and tools. In fact, just a little creativity is what it takes to transform your nails from drab to fab within minutes. 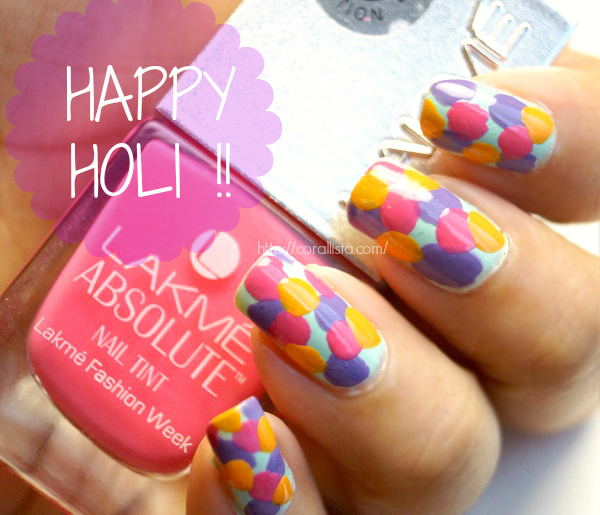 And what better festival than that of colors to go bananas with nail art than Holi! Polka dots or even irregular dots are the easiest, quickest and most fuss-free way to transform some Holi-spirit onto your nails. Start on a clear nail bed or apply a white polish and then put dots to make the colors really pop. There are tonnes of variations to this one too. You could even do a multicolored splatter – a colorful array of splatters covering the nails simulating the splatter of powder everywhere on skin, clothes, hair. 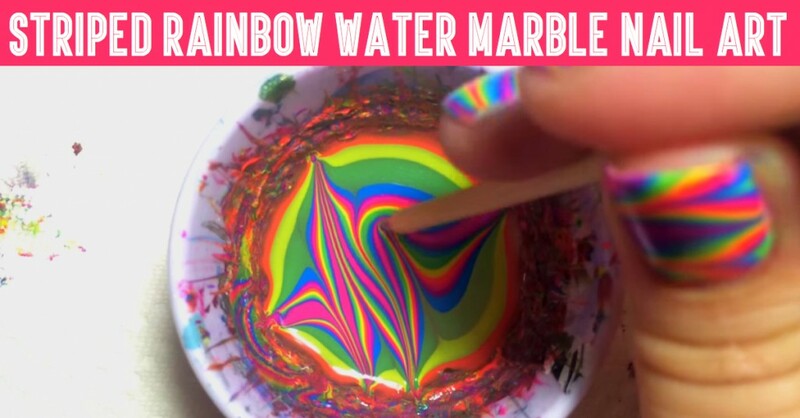 Water marbling has taken the world of manicure by a storm, making creative and cute nail designs without actually using any artistic skills or complicated nail art tools. Get in on the nail art trend with this innovative tie-dye technique. It could be a little tricky, a tad messy and quite time consuming initially, but once you get the hang of it you will get better. Practice does make perfect :). After all, the final result can be well worth the effort. This is how you can do water marbling at home: Paint nails with a base coat and apply moisturizer on the skin surrounding the nail. The nail polish will stick better to the base coat, and will be easier to remove from moisturized skin. Open the lids of all the polishes you intend to use, and keep them within easy reach. This will allow you to work quickly – something that is essential here. Draw the brush out of the first nail varnish bottle, keeping the brush loaded with polish. Holding it close to the water surface (take a shallow cup of water), allow a drop to fall onto the water. You should see the polish drop disperse across the surface to form a thin film. Select your next polish quickly, and repeat the process, aiming for the centre of the first layer of polish. Repeat this process again, with contrasting colors. Aim for around 3-4 layers of color. Take a cocktail stick and drag it gently through the colors to create a pattern. Avoid the outer circle as this is likely to have begun to dry already! Place your nail into the nail polish pattern and push your finger right down into the water. Use the cocktail stick to remove the remaining polish from the water surface and remove your finger from the water. Use your nail polish remover to carefully clean the excess polish from your finger and tidy up the edges of the nail. Allow the nail to dry and admire your nail art! Don’t forget to seal your design with a glossy top coat. 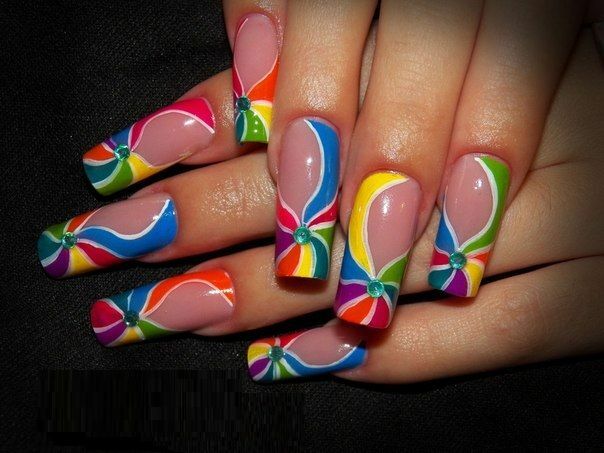 For that Holi party, make sure you are ready all the way to your finger tips with rainbow nail art patterns. Whether ombre or sponged or marbled or just plain freehand streaks – nothing screams ‘HOLI’ more than this glamorous style. Forming a triangle on a white background with the help of some striping tape, you turn it into a piece of art filling it with loads of different shades of nail varnish. Plus, you don’t even need to have a steady hand at drawing to welcome the burst of colors onto your fingertips. You can paint on abstract patterns or tribal motifs in different hues.